Thanks to Drs. Aysha Mubeen and Raafat Makary, University of Florida College of Medicine, Jacksonville, Florida (USA) for contributing this case and Dr. Ayse Ayhan, Hamamatsu University School of Medicine and Seirei Mikatahara Hospital (Japan) for editing the discussion. To contribute a Case of the Week, first make sure that we are currently accepting cases, then follow the guidelines on our main Case of the Week page. (2) February may have been a short month, but we had a record number of 29,472 sessions per day. This is a 34% increase from February 2017. To see our other traffic statistics please visit: http://www.pathologyoutlines.com/monthlystats.php. 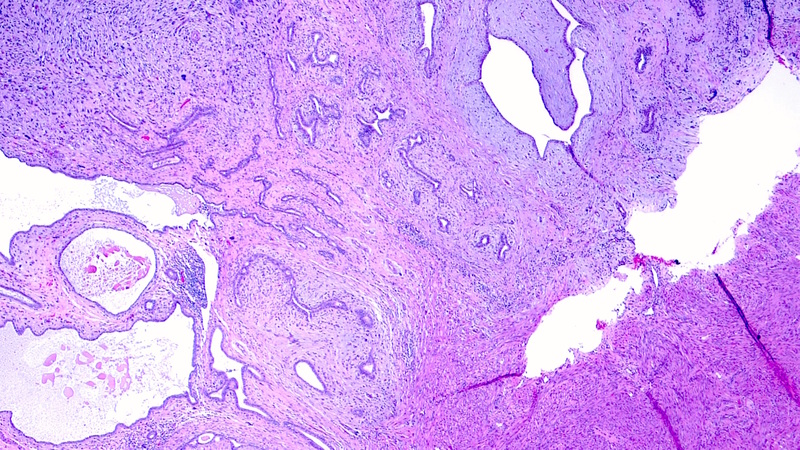 Which of the following is a poor prognostic factor for uterine adenosarcoma? 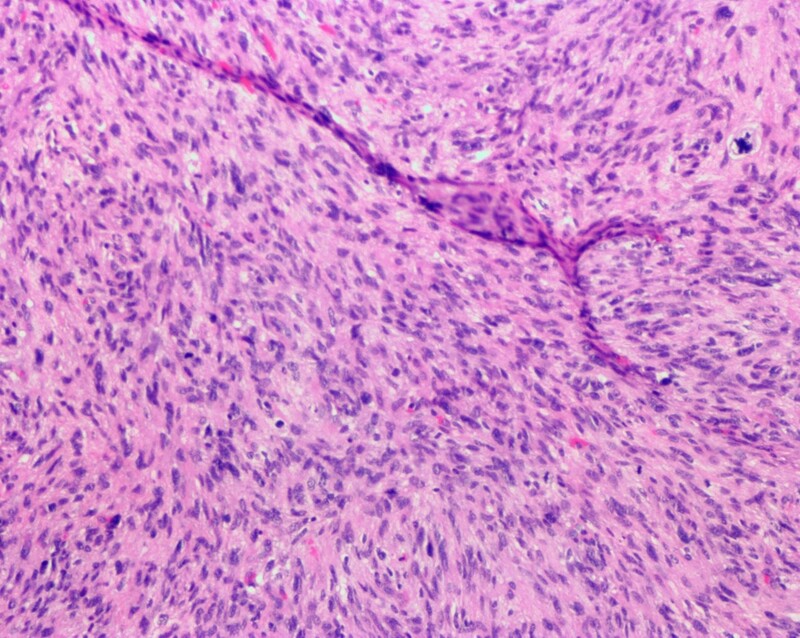 Adenosarcoma is an uncommon biphasic tumor composed of malignant stromal and benign epithelial components. It usually affects postmenopausal women, presenting with pelvic pain or vaginal bleeding but there may be no symptoms at all. The corpus of the uterus is the most common site. It usually carries a good prognosis unless accompanied by deep myometrial invasion or stromal overgrowth. Grossly, these tumors are usually polypoid and exophytic. 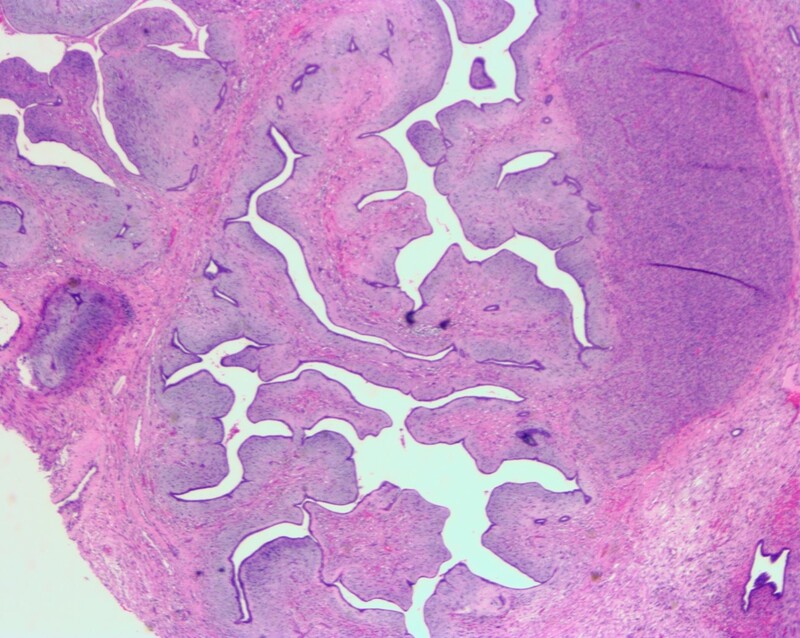 Histologic examination shows a leaf-like architecture reminiscent of phyllodes tumor of the breast. 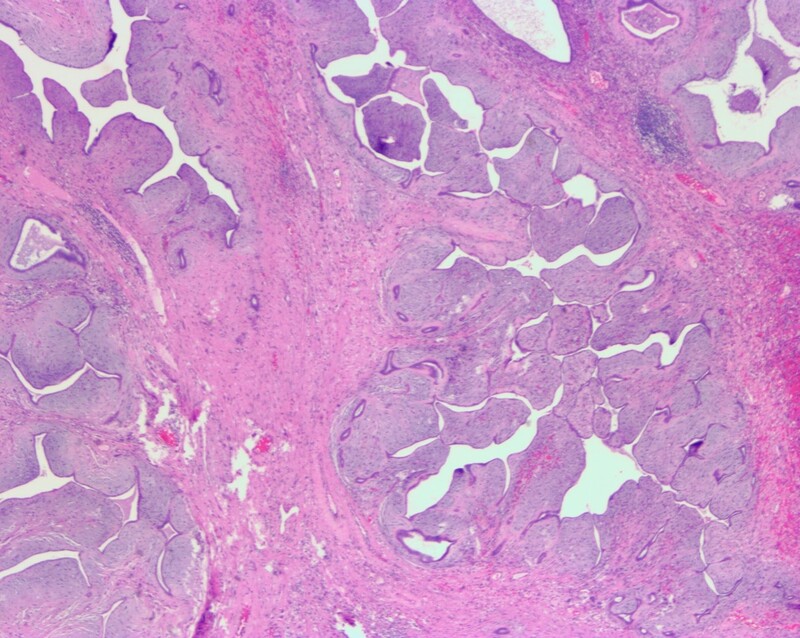 Benign glands are compressed to slit-like spaces by the overgrowth of malignant stromal cells. There is usually periglandular condensation of stroma. Sarcomatous overgrowth is seen in about 10% of the cases. It is a prognostically significant finding and is defined as the presence of pure sarcoma (without any epithelial component) comprising at least 25% of the tumor. In our case with sarcomatous overgrowth, one can appreciate frequent mitoses and prominent atypia. Only minimal myometrial invasion was identified. 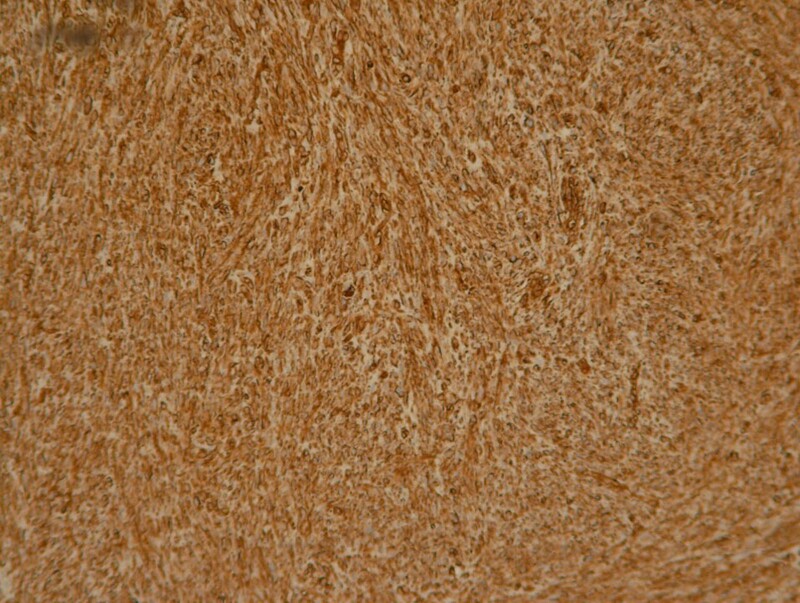 The area of the sarcomatous overgrowth stained diffusely with smooth muscle actin consistent with leiomyosarcomatous differentiation. The poor prognostic feature is implicated in the clinical course of our patient. The main differential diagnoses are endometrial polyp, adenomyoma, carcinosarcoma, leiomyosarcoma and endometrial stromal tumor (Arch Pathol Lab Med 2016;140:286). 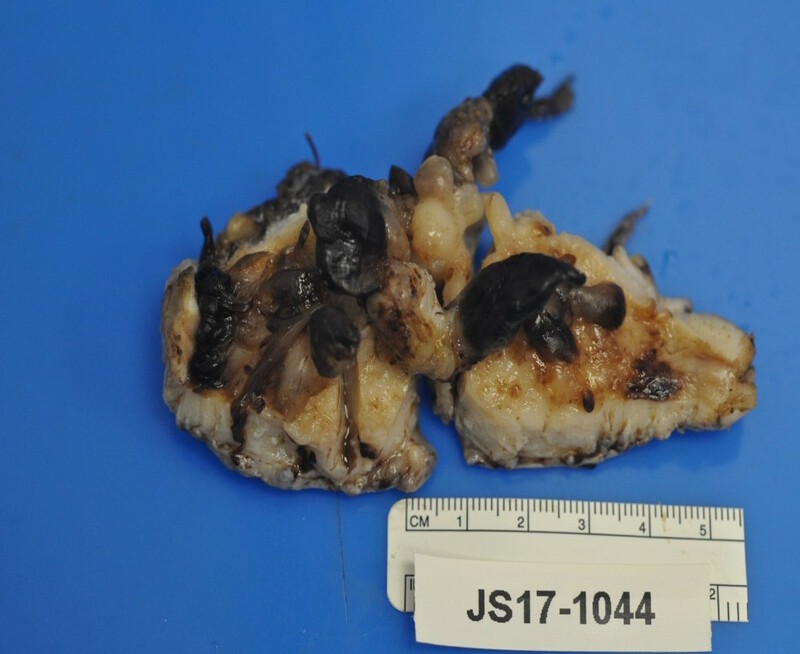 Our case highlights that adenosarcoma, although uncommon, should be considered in the differential diagnosis for a biphasic uterine tumor. This case also fulfilled the criteria for a radiation induced sarcoma, namely a tumor at least 5 years post radiation with a different histologic type but within the field of irradiation (WHO Classification of Tumours of Female Reproductive organs, 2014, p.149). For this patient, no chemotherapy was given. After 5 months, she was readmitted with abdominal pain. Pelvic CT showed a large peripherally enhancing central fluid density measuring 9 cm. 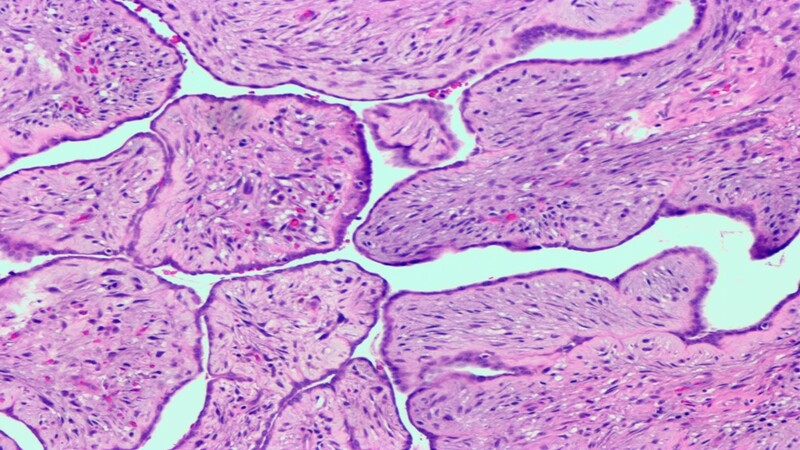 Image guided drainage revealed hypocellular material with blood elements but no malignant cells. At surgery, a large pelvic mass was noted in the right lower quadrant consisting of friable, hemorrhagic, straw colored gelatinous material. 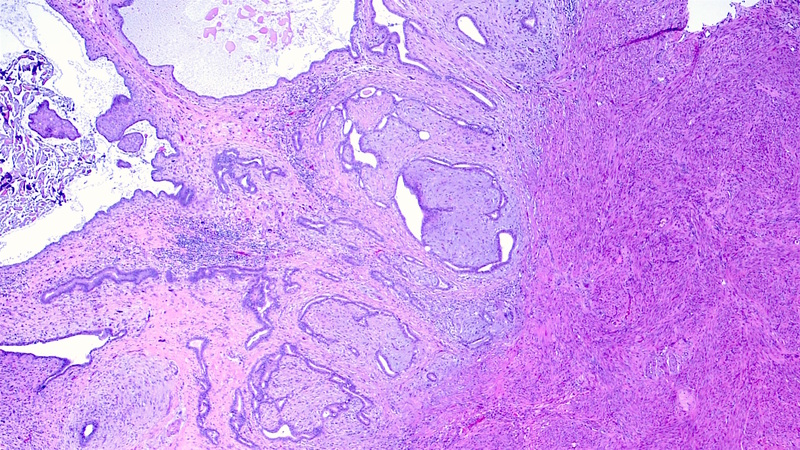 The mass was unresectable, but a biopsy was reported as recurrent high grade adenosarcoma with extensive necrosis, no epithelial component present. She succumbed to her illness a month later. Poor prognostic factors are presence of sarcomatous overgrowth and deep myometrial invasion.